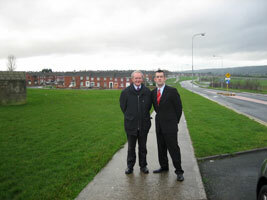 LIMERICK Sinn Féin’s Maurice Quinlivan has strongly welcomed the publication of vision documents for the regeneration of Moyross, Southill and Ballinacurra Weston this week. Quinlivan said Sinn Féin is keen to offer its support for the plans to improve facilities and services in both areas, something for which the party has been campaigning for over many years. “The ideas contained in the vision documents have the potential to bring a significant degree of hope to these seriously deprived areas, so of course we welcome them and hope that, once we know the full detail, we will be able to offer our wholehearted support for them,” Quinlivan said. The Sinn Féin representative said that he agreed with former Dublin City Manager John Fitzgerald where he said in the report that the three critical strands are intensive policing intervention, economic and infrastructural regeneration, and a co-ordinated response to social and educational disadvantage. Maurice Quinlivan said that he is particularly pleased that many of the ideas, policies and suggestions advocated by himself and Sinn Féin over a number of years are contained in the report. He said that getting the housing situation right is crucial to the success of the project and he is encouraged by the intent of the agencies that a major effort to promote home ownership will be pursued. Turning tenants into homeowners would act as an incentive to maintain and improve properties which, in turn, will improve the broader environment and encourage people to stay in these areas. “I agree with the agencies that we have yet to achieve a normalised situation with regard to policing. Effective policing is the key to any successful regeneration. Sinn Féin will strive to ensure that we have a civic policing service that solves problems, operates with appropriate accountability structures, serves the people of Limerick and enhances community safety. Without a radical new approach to policing the whole of the regeneration process is doomed to failure,” Quinlivan said. He particularly welcomed the recommendation that regeneration agencies will ensure that local residents especially will benefit from any job and employment opportunities. The establishment of the necessary training programmes and support services to ensure that residents can access employment opportunities, (providing Safe Pass courses, etc) must be fast-tracked, he said. Maurice Quinlivan also welcomed what he called “the sober and honest recognition” in the documents that “the current regional approach to tackling Limerick’s drug problems is not sufficient due to the nature and scale of drug trafficking, misuse and addiction in Limerick City”. Sinn Féin has long argued the need for a local drugs task force in Limerick but the Government has dragged its feet on the proposal. Applauding the proposal that initiatives to address educational disadvantage be prioritised, Maurice Quinlivan pointed out that he has long argued that addressing issues such as social exclusion and educational under-achievement, including poor school attendance and early leaving, is central to tackling crime and anti-social behaviour. In addition, he said, a family-based approach should be adopted that encourages and supports parents/guardians to be active participants in the education process. The situation where some local schools continue to offer too few places to pupils from disadvantaged backgrounds has to end. “Sinn Féin will study the documents very carefully before we respond in full at a later date. However, our initial reaction is to welcome the vision documents as a serious start at addressing major social problems which have bedevilled Limerick for far too long. It is important to emphasise that this is just the beginning and that there is a huge amount of work to be done which will require a long-term commitment – and major investment of resources from the Government. What we don’t need is what we have had too many times in the past: fine words which have led to little or no action on the ground.